Back in November of last year when I looked at what the ACA was going to mean for me, I zeroed in on a plan from Aetna that was outside of the ACA. It provided for a $1,750 deductible and I would pay 30% after the deductible up to $10,750. This would (and has) cost me $223 a month. The closest equivalent I could find on the exchange was a plan with a $3,500 deductible, for which I would pay 20% after the deductible up to $6,350. And this would cost me $413.21 to 429.76 per month depending on what subsidy I qualified for. That would have been $2,282.52 more for the year. What will it cost this year? No idea. And it looks like they’re not telling me until November 15—after the elections. You might say, wait, there’s a transitional policy fix to let people continue their existing insurance plans into 2017. Not for me. I moved to another state in December 2013, and under our fucked up health insurance system policies are forbidden from being portable. I purchased a new plan starting December 15. For reasons that are as confusing as the ACA, that plan is not eligible for keeping. Is it because it was after October 1, 2013? My policy wasn’t in effect in October of last year. It didn’t start until December 15. I couldn’t keep my older policy because policies aren’t portable between states. And the White House hates me. Or is it because it renews in December? CMS further stated that, under the transitional policy, non-grandfathered health insurance coverage in the individual or small group market that is renewed for a policy year starting between January 1, 2014 and October 1, 2014 will not be considered to be out of compliance with certain market reforms if certain specific conditions are met. Or is it because it’s a post-March 23, 2010 plan? Grandfathered plans are those that were in existence on March 23, 2010 and haven’t been changed in ways that substantially cut benefits or increase costs for consumers. Insurers must notify consumers with these policies that they have a grandfathered plan. Individual grandfathered plans can’t newly enroll people after March 23, 2010 and have that new enrollment be considered a grandfathered policy. 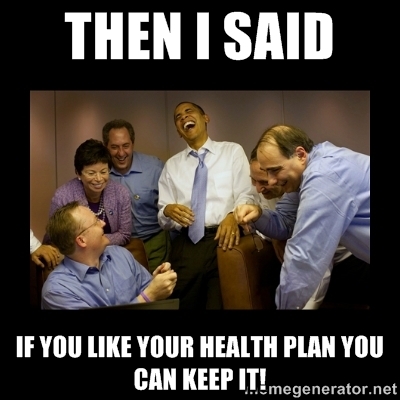 But insurance companies can continue to offer the grandfathered plans to people who were enrolled before that date. I received the notice a few weeks ago. It took me this long to rant about it because I prefer to understand what I’m ranting about. I still don’t understand this. As far as I can tell, President Obama’s vaunted grandfathering excludes policies started over four years ago. That doesn’t make any sort of sense. I suspect that part of the purpose of this law was to be so nonsensical that no one could understand it enough to complain about it. Repeal it. Replace it. With something that makes sense as insurance. At least replace it with something that makes sense to non-politicians. Calculating the subsidy is pretty much impossible when you know you’re going to go through some life changes over the next year or work for yourself. You have to know how much you’re going to make. If you don’t know how much you’re going to make, you don’t know how much the subsidy is. The whole system perpetuates the assumption that everyone has standard jobs, that is part of what was broken about the system in the first place. If you like your health insurance, you can go screw yourself last modified October 14th, 2014.